Back to 2018 news stories. January 24, 2018 - Helicopter Links Advertising Tips. (San Diego, California, USA): For many companies, advertising is now part of an integrated marketing communications plan. According to Wikipedia, "Integrated Marketing Communication is the application of consistent brand messaging across both traditional and non-traditional marketing channels and using different promotional methods to reinforce each other." Branding, marketing and advertising includes such things, but is not limited to having a good logo, by-line, knowing your market, press releases, having a website, printed material (such as flyers and business cards), appearing at industry trade shows, using social media and advertising in trade publications. If you are a medium or large corporation and don’t employee people such as graphic designers, web designers, professional writers and social media personnel as part of your marketing communications team, the question that must be bluntly asked (with no offence): "Why haven't you hired these types of employees to help market your company in a professional way?" When it comes to a small business, if you can afford to employ a web designer, graphic designer and a professional writer, your small business is doing better than most! 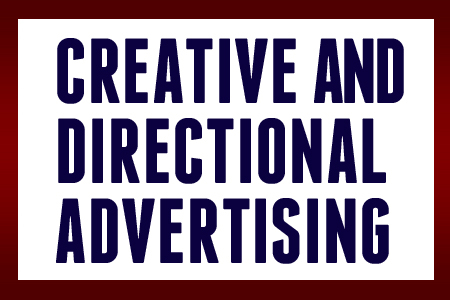 But back to advertising, there are two types of advertising: Creative and Directional Advertising. 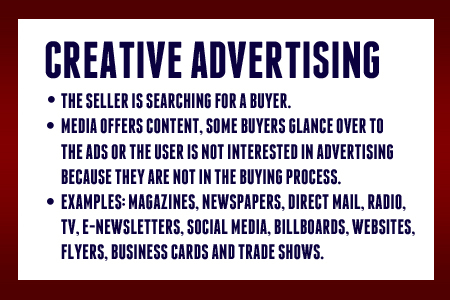 Creative Advertising is any type of advertising where the seller is searching for a buyer. Some of the most well known Creative Advertising media outlets include magazines, newspapers, billboards, radio, TV and the newer online affiliate marketing (for example, Google Ads, Commission Junction, etc.). Creative Advertising typically relies on millions of readers, listeners and viewers (or if not millions, a large number of people) for Creative Advertising to be successful. Most of these advertising outlets offer subject matter to read, hear or watch as they mix in advertising with their content. In addition, Creative Advertising includes direct mail, e-newsletters, flyers, trade shows, trade show give-aways, trade show graphics, selling company apparel, company signage, free samples, promotional items or pricing, business cards, company websites, social media and more. Therefore, Creative Advertising is any type of advertising that is not Directional Advertising. Directional Advertising (also known as Directory Advertising) is where the buyer is searching for a seller. Directional Advertising is any type of directory such as a printed yellow pages or an online directory such as Helicopter Links, where there are categories of types of businesses, indexed, to make it easy for a buyer, to find a seller. When using a directory, the buyer wants to look at the banner ads (or advertisements) because they are using the directory to search for a specific service, product or supplier, and are trying to find a company which can handle their buying needs. Remembering back before the internet (when many people used the printed yellow pages), if your water heater just broke on a Sunday night at 10:00 p.m., what did people do? People opened their yellow pages, turned to the plumbing section to find a 24 hour, 7 days a week plumber because they want to take a hot shower Monday morning before they go to work! 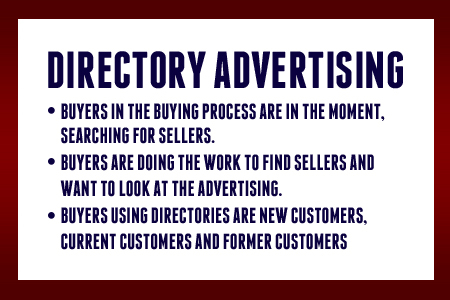 This is why directories are extremely useful to buyers, they help buyers with a buying need, to find a seller. Directional Advertising has fewer customers than Creative Advertising because buyers are now at the point of wanting to contact a seller (they are ready to buy or they are researching before buying). This is why it is important for companies to advertise on a directory, such as Helicopter Links, because your company can advertise directly to buyers in the buying process and your advertising helps determine if they buyer will contact your company over those companies listed on Helicopter Links which are not advertising. How Helicopter Links works is this: We search the internet for companies in the helicopter industry. Then we provide every company in the helicopter industry with a free listing on Helicopter Links website in the category where their business belongs. Those businesses which want to gain more clicks and stand out among the free listings, can do so by advertising on Helicopter Links website. Advertising on Helicopter Links website makes it easier for buyers to find out what your company provides because it's easier for buyers to see your ads and learn about your company. Advertising also reduces the buyers time and effort while they are searching for a seller. Creative Advertising and Directional Advertising compliment each other. The best integrated marketing communications plan is when companies use both Creative and Directional advertising. For example, people visit your trade show booth or see your company's ad in a magazine. Then three (3) months later, when the buyer needs to buy a product or service, the buyer might not remember the name of your company and therefore searches a directory. The buyer sees the same ad in the directory and then contacts the seller. The buyer then finds Helicopter Links website, and recognizes your advertising from the trade show or from the display ad in the helicopter magazine and then call your company. This is one example of how Creative Advertising and Directional Advertising easily complements each other. Helicopter Links is Directional Advertising. The advantage of advertising on Helicopter Links, is our visitors want to look at banner ads. As stated before, while less people use directories than magazines; magazine readers are there to read the articles and many magazine readers are not in the buying process. However, the majority of Helicopter Links visitors (per Google Analytics) are buyers in the buying process and want to look at the advertisements. Buyers (from inside and outside the helicopter industry) go online to find a helicopter operator, supplier or service. Our visitors type in multiple search terms, in search engines, such as "helicopter construction companies" or "helicopter fire fighting companies" or "helicopter utility companies" or "helicopter trade shows" or "helicopter electrical components" or "helicopter manufacturers" and etcetera to find sellers online. Our visitors find a link to an appropriate Helicopter Links web page. Then our visitors use Helicopter Links website to find a seller. This is why Helicopter Links is useful to buyers and to sellers. The majority of our visitors are buyers searching to do business with sellers, in the helicopter industry. In the Age of the Internet, people like convenience. Helicopter Links is a website which can be accessed anywhere in the world, 24 hours a day, 7 days a week and year-round. Not only do people from inside the helicopter industry use Helicopter Links to contact companies, organizations and related services in the helicopter industry but we also have contractors, utility companies, oil pipeline companies, other large/small companies, government agencies and private individuals — using Helicopter Links website (and calling and emailing us) from outside the helicopter industry, looking to find helicopter operators for very specific jobs. Please feel free to contact us by phone or email and let's get into a discussion about your company's advertising needs and Helicopter Links advertising options. Let's get some well placed advertising for your company on Helicopter Links website to help new customers, current customers and former customers, find your company. Please contact us by calling +1 (858) 413-7074 (San Diego, California, USA) or email us at staff@helicopterlinks.com. Helicopter Links is an online directory which lists helicopter manufacturers, operators, suppliers, services, magazines, helicopter trade shows, air shows and conferences, museums, associations and more. We also offer one free link to any helicopter related business in the world and are media partners with multiple helicopter trade shows and associations around the world.